Queen Titania and her bees are the swarm that arrived in the nucleus box up on the treehouse platform towards the end of June (see here). Over the past couple of weeks I've been moving them from that lofty position down to the nearest hive stand where today I transferred them into a brood box. There was visible consternation among the flying bees after each stepwise move, as they had to reorient to the hive in its new location. Too big a move and they might not have found the new position, so I brought them down gradually on a tower of boxes, taking out one box each time. 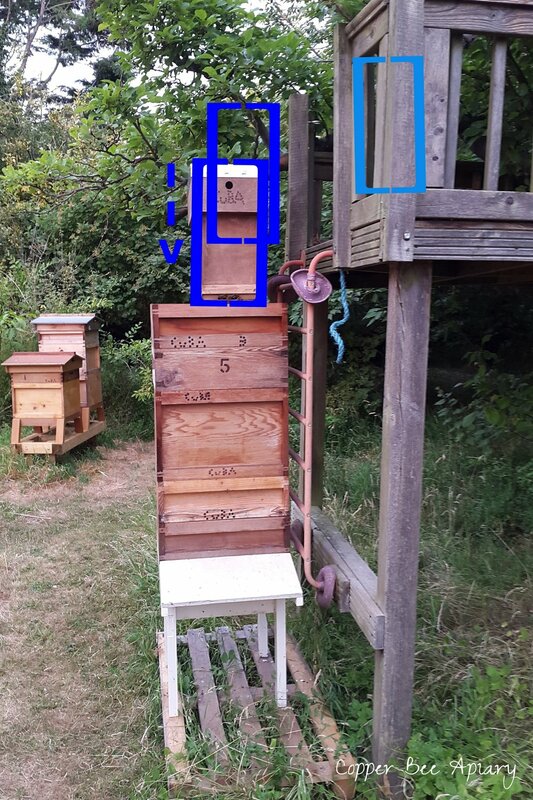 They have one last step to go, when I remove the box from under their hive so it sits directly on the stand. Queen Titania is dark brown-black. I was surprised. Although I've had queens just as dark in the past, I suppose I expected this new queen to be coppery golden coloured like the others that arrived in local swarms.